Moved into a new-to-you home lately and wondering what kind of wood your floors are made from? You can often tell what type of wood simply by looking at it. Many species – oak, pine, fir – are easily recognizable. But it also goes beyond. From looking at the surface, you can’t tell if a floor is solid or engineered, which is an important factor if you are considering sanding and refinishing it in the future. Moreover, a quick look may leave you thinking you have one type of wood, when in reality a stain has given it the appearance of another. To get an accurate assessment of the wood flooring you currently have installed, it may take a little work. 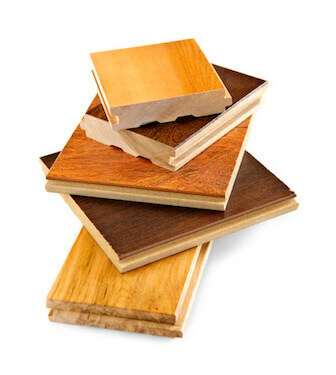 Determine if your floor is a softwood or hardwood by pushing your fingernail into the surface. It will make a dent if it is a softwood such as pine or fir. Find an inconspicuous part of the floor – in the corner or under a cabinet – to scrape the finish off of part of the board. This will remove stains or paints and get down to expose the original board. Determine if the boards are solid or engineered by examining a cross section. This works well at a threshold or transition. You can also pry off a baseboard and use a mirror between the boards and wall to determine if it’s solid. Once you’ve reached the core wood sample, use online wood guides to help pinpoint the type of woods used in your home. Oak is the most common type of hardwood used throughout the US. Maple is slightly harder than oak, but often has light graining and a smoother, sleeker look. Pine is softer and more easily dented. But does have character and is used a lot in older homes. Fir is a beautiful vertical grain that was used a lot around the turn of the 20th century. If you have questions about your current flooring, the best way to find out more is to stop by. We can help you determine what is currently installed, and the best way to move forward to create the perfect look for your home.